Homemade Yogurt Recipe – Quick & EASY! Several years ago I became interested in recycling and conservation. My suburban city had just started a recycling program and I was all over it! As a result I began to also look for ways to reduce the volume of my family’s trash that was sent to the landfill. I started being very mindful of what I purchased, shunning it if I felt it was overly packaged. One place I felt I didn’t have control was with yogurt. My city’s recycling program didn’t accept the kind of plastic that these yogurt containers were sold in. Although I was all fired up over recycling, I’d sigh and throw these containers in the trash feeling I had failed in my environmental quest. Then I started wondering “I wonder if I can MAKE yogurt?” A quick search of the internet showed that I could indeed, and there were several recipes. I’ve never looked back! I’ve made 1/2 gallon of yogurt about every other week for decades now & it’s shamefully easy! Plus I make my yogurt in single-serving 1/2 pint glass canning jars so other than the milk jug itself there’s NO TRASH, recycling or otherwise. I’m happy to share my method with you – the recipe will be included at the bottom. The abbreviated instructions are as easy as this: Heat milk & powdered milk to 180 degrees, cool to 105 degrees, stir in yogurt starter & incubate in warm place undisturbed until thick. Whaaaaat? Can it really be this easy? YES, Really! I start with 1/2 gallon of 2% milk and stir in 2 cups instant powdered milk. This makes the yogurt a little thicker and I believe it also adds protein. I’ve tried this recipe with skim milk but wasn’t happy with the texture of the yogurt. I’m sure I would love the texture of whole milk but the 2% is a happy balance – nice silky-thick yogurt with less fat. Feel free to use whole milk if you like. Then I heat the milk to 180 degrees stirring often. I often abbreviate this step by pouring my milk & adding the powdered milk in my pan, then covering it and setting it aside while I enjoy my morning coffee. Since that short period on the counter means it’s closer to room temp when I start heating it, it also means less time standing at the stove stirring and less propane is used too. It’s certainly something that works for me. After the milk has reached 180 degrees it’s time to cool it down to a safe temperature for the yogurt cultures. That’s about 105-110 degrees. You could leave the pan on the stove with the heat turned off. But I found a milk skin always formed on top of the milk when I cooled it that way. I’d try to remove it or stir it back into the yogurt. But I could never remove or dissolve it all. And I just wasn’t fond of that texture in my yogurt. So instead I fill a bowl with ice and water and set the pan down into the ice bath. The temperature is monitored until it reaches about 105-110 degrees. During the heat of summer when our crappy ice maker can’t keep enough ice to keep RancherMan & me in cold beverages after a hot day in the pastures, I started using this Homestead Hack so I can reserve ice for RancherMan & me. When my milk is cooled to a safe temperature I stir in about 1/3 to 1/2 cup of my own homemade yogurt to act as a starter. These are the active cultures needed to make your milk into yogurt. 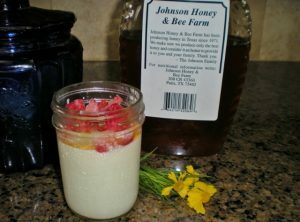 I use my own homemade yogurt for starter but for your first batch you can purchase plain unflavored yogurt. Just make sure it contains active yogurt cultures – not all yogurts do. Two good ones to use are Braum’s and Dannon yogurt. But be sure to check your labels and buy only yogurt with live active cultures. I stir my starter into the milk, making sure everything is fully incorporated. 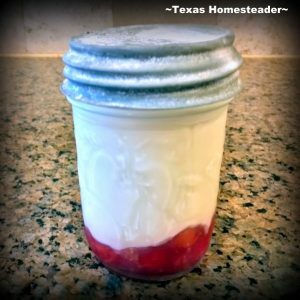 When fully incorporated I pour my yogurt/milk mixture into 1/2 pint canning jars and place a repurposed lid on the jar. This gives me convenient single-serving yogurt containers, but you can certainly use larger sized jars up to about quart sized. If you’re doing single-servings like me be sure to leave enough space to stir in something sweet when you’re ready to eat it. I like to sweeten mine with honey & fruit or homemade Blueberry Jam or a chunky Pear Preserve. My yogurt is now ready to incubate for about 6 hours. The longer it incubates, the thicker and more tart it will be. To give my yogurt a warm environment to do it’s yogurt thaaaaang, I heat my oven for about 60 seconds then turn it back off. This brings the temp inside my oven to a low-heat warm environment – perfect for yogurt cultures to multiply! I place my jars into the oven and turn on the oven light to maintain a little heat. With my oven I often turn the heat back on about after 3 hrs incubation time for ONLY 1 minute, then turn it back off. This seems to keep the temps perfect for my yogurt to incubate. My previous oven didn’t require that since I guess the bulb itself burned hotter than the bulb in my new oven. Gently bumping the heat like that seems to keep the temps where my yogurt cultures are happy, but be sure you don’t let it get too hot & kill your cultures! Of course you can buy an automatic * yogurt maker that keeps the proper temperature for you throughout the duration of your yogurt incubation. Just set the timer and walk away. The yogurt is usually ready after 4 hours incubation, but RancherMan likes me to leave it 6 hours. I simply remove it from the oven, allow to cool a bit and place the jars in the fridge. I often make plain yogurt and leave the sugar and vanilla out until I’m ready to eat it. That way I can use the non-sweetened yogurt for other things as well such as low-fat sour cream substitution in both cooking and on baked potatoes. It’s even an important ingredient in RancherMan’s favorite Country-Style Biscuits. When I want to eat sweetened yogurt I’ll either stir a spoon of my favorite jelly to sweeten or a squeeze of local honey with a spoonful of fruit or berries. And I love to sprinkle some Homemade Pumpkin Granola on top for a little crunch too. All that’s left to do is enjoy! Commercial yogurt often has added gelatin & thickeners (often along with some chemical nasties I'm afraid.) The taste of the homemade yogurt can't be beat, is significantly cheaper and healthier for you. And no more plastic yogurt containers go to the landfill! Cool milk down to about 105 to 110 degrees. Add yogurt starter and stir well to incorporate smoothness. (if making sweet yogurt, add vanilla now). Fill glass containers of your choice and place lids on jars. Place jars on cookie sheet. Heat oven to 110-115 and turn off oven temp. Turn on oven light. Place yogurt in oven on rack and leave for about 4-6 hrs. Yogurt will be "done" in 4-6 hours but you can let it incubate for up to 12 depending on how tart you like it and how much beneficial cultures you wish it to have. Don't disturb the jars for at least 4 hrs. Then you can check to see if the yogurt is done by gently tilting one of the jars. If it's no longer liquid, it's ok to pull it and place in the refrigerator. There ya go – 1/2 gallon of homemade yogurt! I share lots of fun stories & recipes on our facebook page, so c’mon by & follow us on Facebook. 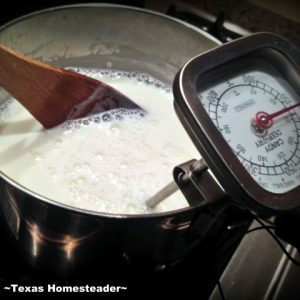 This entry was posted in Blog Posts and tagged Cooking, Environment, Frugality, Recipes on March 15, 2013 by Texas Homesteader. Since I’m making my own granola now, I thought the next step is to make my own yogurt. Thank you for this awesome tutorial! We’re just returning from living in Japan for the last oh-so-many years and I brought my culture back with me. Once I’m settled, I’ll have to overnight you some, for fun. It’s a mesophilic combination of two strains that gives you a thick and creamy yoghurt with almost no whey bleeding out and no need for powdered milk or heating/setting at temperature. I take milk from the fridge, stir in some of my last batch, set it on the counter for 12hrs and then pop it in the fridge to enjoy. I used to do it as you describe, but as with most things in my life, I learned that the Japanese do it more efficiently and with less waste. Thanks for posting – you’ve inspired me to try it! If I can’t do it all in one day, can I cook on the stove in one day, refrigerate, and into the oven the next day to set? Thank you! Heating the milk to 180 causes the protein strands to uncurl. Then they can culture into yogurt. Pingback: Milking My First Cow: Using FRESH Milk! I love to read stories about the things that people make to cut ties with the grocery stores. I use a yogurt recipe from the Tightwad Gazette books and have had great success. Plus, I use a heating pad instead of my oven. It runs on 110v instead of 220v, so it saves money on the electric as well. I wrap my milk/yogurt mixture in a towel and cover the whole thing with a big stock pot and let it work on the heat pad overnight. Works every time! I LOVE the Tightwad Gazette! Man that Amy was ahead of her time, eh Lucy? I don’t mind using the oven to incubate my yogurt because it’s only on for 1 minute to warm it for the yogurt. Sometimes I have to turn it back on during the incubation time but again only for 1 minute. I love to make yogurt and make it about every week and a half. Delicious and so good for you! I’ve started making 1/2 of my jars with a tablespoon of jam in the bottom of them so they’re ready to stir & eat right out of the fridge while still leaving several jars unflavored for other uses. I found that the longer the batch cooked that the temp kept going higher so at 1 AM I checked and it was good and solid. It went in the frig for the rest of the night. This morning I did a taste test. It was as good as the Dannon that I used for a starter. Plans are to mix some blueberries in it and then freeze in cubes until the fresh/outdated Dannon is used up. I will reserve a couple of “cubes” of plain to use as a starter for the next batch. I do confess I use a yogurt maker.I use whole fat milk because I like the texture better.I sweeten it with honey and top it with the home made granola recepie from TMR,when I’m ready to eat it. Pingback: MYO Quick & Easy Healthier FUDGSICLES! 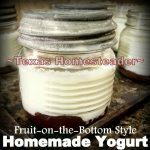 I’ve been making yogurt for about a year but never thought about putting it in a smaller jar – great idea! I have another question…….. Can this be made with nonfat milk? Hey Girl!, this is my go to method. I started about a year or so ago with an Easiyo thingy, but then changed to the heating pad method. When I found this I knew it was the method for me. I use either pint jars or small Weck jars and I leave my yogurt in the over over night. I love it when I can tip the jar sideways and the yogurt is so thick that it doesn’t even move! When I give someone a jar of my yogurt at work people think they are someone special. I’m off to check out some of the linky places. It looks like you have cows on your ranch, so I’m wondering why you have to buy milk. And why in the world would you use 2% milk and powdered milk? How long will this keep and does 1/2 gallon milk generally make a half gallon of yogurt? Can’t wait to try this! I didn’t think I could make it because I didn’t have one of those special yogurt warmer things. I have a question for you. How do you get the hashtag of your blog name to automatically show on your pinterest pins when people pin it? Awesome about the hash tag thing, thanks!! I’ll be trying the yogurt ASAP. Can’t wait! 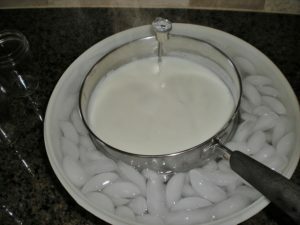 I have been making yogurt like this for a while now, and I am wondering why we heat it up to 180 degrees and then let it cool to 110 or so to add the culture? why not just heat it up to 110-115 and go from there. does anybody know? Thanks. Heating it to 180 changes the structure of the milk a bit and makes the final product thicker. Some folks just heat to the 115. My trick: I wrap the pot of yogurt in a thick towel & then place in the oven; this keeps the yogurt nice & warm. I do pre-heat the oven on the lowest setting for about 5 min, but the oven if OFF when the towel wrapped pot is placed inside. I leave there undisturbed for 5 hrs. That’s it. We sweeten on demand. I transfer to jars after–but I you got me thinking. If I placed them in jars I could leave some unsweetened. I’ll probably cover the jars with a thick towel for good measure. Also: I make a cream cheese aka yochee by placing coffee filters in my colander and straining off the whey. I keep a pan under the colander & place the whole thing in the refrigerator to strain for a day or two. I use the yochee just like cream cheese–even for cheesecake! I use the whey in smoothies or mix into the dog food (our dogs love it). This makes making yogurt clear. For some time I wished I could do this. Do you need (is it a must ) to use powdered milk? I am motivated to try this again! Thank you, TMR!! This is awesome! 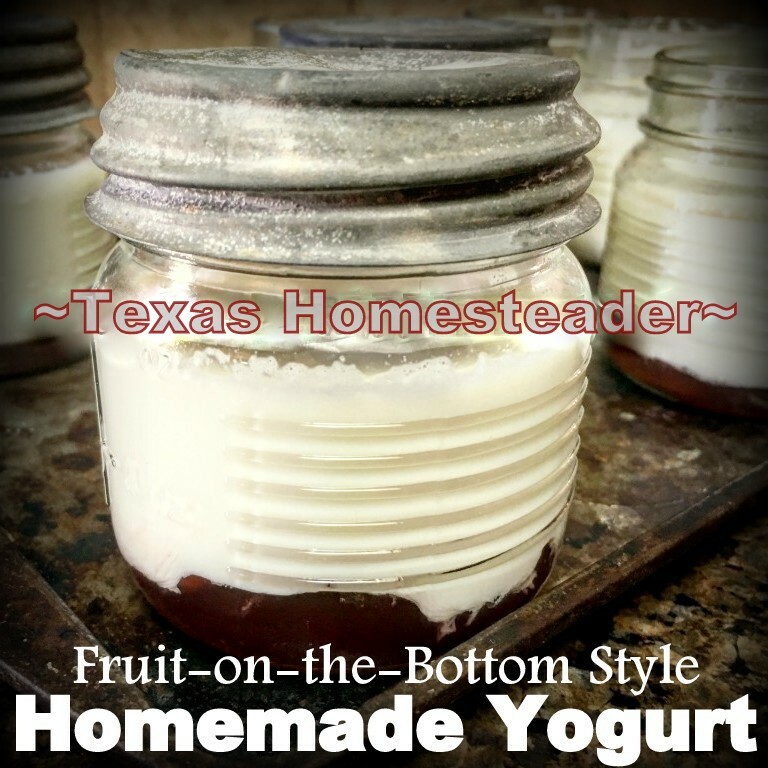 I have been wanting to try homemade yogurt, but, haven’t made the jump yet..this looks so good, I will have to try it soon 🙂 I wanted to invite you to link up at my weekly linky party Share Your Stuff Tuesdays at: http://bit.ly/18KMofU Hope to see you there! Loved your post! I bought a yogurt maker to do mine. I linked my name to my yogurt post from a couple of months ago if you want to check it out. I make greek yogurt by straining, and I thicken my yogurt by using powdered milk. Thanks so much for sharing your recipe for making yogurt!!!!!!!!! I had no idea that yogurt was this easy to make! i should try this sometime! Thanks so much for joining us at last week’s All my Bloggy Friends …. We look forward to seeing what you share this week! Great tutorial! I always thought you needed to have a yogurt maker. What a great idea to just preheat your oven and then turn it off. Thank you again for linking up to the HomeAcre Hop. I’ve been making yogurt for several years, and I just place a crockpot liner on top of a heating pad overnight to keep it the right temperature. I’ve never made sweetened yogurt so I came online looking for tips, since stirring the yogurt after it sets tends to make it runny. You say you add your vanilla after the milk cools, is that when you add the sugar as well? It’s just one fun thing after another on here! Thank you! So delightful! I make my own yogurt, too, using the crockpot method. I love the taste compared to storebought. Thanks for linking up to Fabulously Frugal Thursday! Great recipe – we usually use a cooler to keep the milk warm – but I’ve heard good things about using the oven – may need to try it. The organic milk here is ultra pastuerized… that won’t work, will it? Guess I need to find some raw milk (not sold in my state.. sigh.) Thanks for sharing with us! I hope you stop by again next week at Eco-Kids Tuesday! I am so glad you shared this. I read it the other day and am sitting here making my trader joes list so I think it was a sign that I saw it and re-read it. I am going to attempt to make it with Soy….an luck with that? Wish me luck! WHATEVER YOU DO, DON’T USE ALMOND MILK OR ALMOND YOGURT(AS A STARTER)! It creates a really nasty smelling cloud of fumes that made me gag and it doesn’t produce yogurt. If you have an intolerance to dairy and can drink the Lactaid milk, I use the Lactaid whole milk with no powdered milk and depending on the person either vegan cultures from amazon or 1/4 cup chobani per 4 cups milk as my starter depending on the intolerance level. Someone who cannot tolerate dairy period would be better off with the vegan cultures. With the vegan cultures, you can re-use your own yogurt but then re-introduce a new packet every 6-8 weeks as long as you are making yogurt every 7-10 days. I tend to make the lactose free stuff every week because the vegan cultures are expensive and I don’t want to have to keep using packets every few weeks! I tried about 7 batches with soy milk and tried various recipes that I found online but they all required about 12 different ingredients and a lot of them required thickeners and artificial ingredients to get them to become yogurt. I did the research and the ultra-pasteurized milk is the way to go for someone who has a diary intolerance or allergy for homemade yogurt. I just found you over at Housewife’s How To’s Link up party. So glad I did! this is amazing! I have always wondered about how to make my own yogurt! I can’t wait to give this a try! Thank you for sharing! I just found you on TALU. I haven’t tried making yogurt before, but this looks reasonable. Thank you. Just found you on the Friday Farmgirl Blog Hop…This has got to be the easiest yogurt recipe I have I yet to find! I so want to give this a try!!! Thank you!! Making yogurt is on my to-do list today. Although I’ve made it before, I think you use more powdered milk than I do. I’m going to try your proportions. Thanks! I am so happy to see this recipe! I looked at the yogurt starter last week but had NO clue how to use it!!! We go through about $50 in yogurt a week so this will be an awesome thing to try!!! Thanks again! I found you through the Let This Mind Be in You blog hop. I am hosting a linky party today and monday at my site http://www.frugalfitfamily.com! Stop over and link up if you have time. Yummy! I do love yogurt. When my doe goats start producing milk, I plan to make some 🙂 Thanks for linking up!